A mixed signal oscilloscope (MSO) is the ideal tool for the design and debug of today’s embedded systems providing the only way to see analog, digital and serial data signals simultaneously on one instrument as they occur in real time. Embedded system designers need to view signals into and out of devices such as microcontrollers, DSPs, FPGAs,ADCs, DACs, and transducers while ensuring proper timing and bus traffic. The MS Series offers unmatched digital performance and is available in two models, the MS-500 and MS-250. Designed to capture long records of the fastest digital signals the MS-500 has a maximum input frequency of 500 MHz, while other MSOs are limited to only 250 MHz. The long memory of 50 Mpts/Ch means that these fast signals can be captured for up to 25 ms at up to 2 GS/s sampling rate. On top of this raw performance, the MS-500 supports up to 36 channels —enough for all the ADDR, DATA, control lines and serial data busses. This makes it the perfect tool for embedded systems with 16-bit or 32-bit microcontrollers. The MS-250 is the ideal tool for testing embedded systems with 8 bit microcontrollers or slower digital signals. With 250 MHz max input frequency, 18 channels and 10 Mpts/Ch memory the MS-250 is an outstanding value and provides a complete set of tools for embedded system testing. A great MSO must be built on a great oscilloscope and the WaveRunner® Xi and WaveSurfer® Xs are two of the best. With bandwidths from 200 MHz to 2 GHz, sampling rates up to 10 GS/s, 12.5 Mpts/Ch available memory, and a wide range of math, measurement and triggering capabilities the WaveRunner Xi and WaveSurfer Xs platforms are powerful and versatile. Both models feature a big, bright 10.4" color touch screen for easy viewing of all your analog and digital signals and both are only 6" deep. The WaveRunner Xi and WaveSurfer Xs oscilloscopes come with an extensive set of triggering capabilities aimed at capturing a wide range of analog signals. With the MS Series this triggering is enhanced, adding analog/digital crosspattern trigger, analog/digital event triggering and the capability to select any digital channel as the source for an analog trigger. Cursors and measurement parameters are an important part of any oscilloscope. When using the MS Series these tools measure digital channels as well analog channels. Cursors read out hexadecimal bus values while parameters make timing measurements on a single digital channel, between two digital channels or even between an analog and a digital channel. 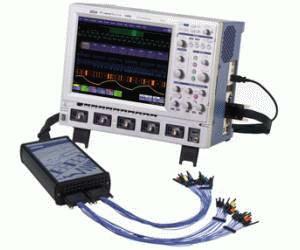 Note: Up to 4 scope channels with WaveRunner Xi and WaveSurfer Xs oscilloscopes.